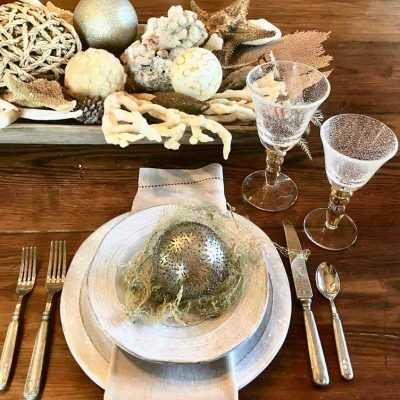 While we at Artful Home don’t consider our perspective a trend-driven one—we believe fine art, craft, and design offer beauty and inspiration that transcend fads—it’s not rare for us to uncover themes as we select items to feature in our seasonal assortments. For spring, we discovered vibrant colors, bold shapes, and, naturally, florals, but as we pored over the pages of our newest catalog, one unanticipated theme also revealed itself to us: sustainability. Sustainability is broadly defined, but at its core, the notion is rooted in establishing or maintaining a harmonious relationship between humans and their natural surroundings. The word has different applications depending on the context and scale—sustainability can be as grand as slashing manufacturing waste or emissions, or as simple as upcycling cast-aside objects—but the end result contributes to the preservation of the environment for future generations. Whether incorporating sustainable practices into their creative processes or drawing inspiration from the inherent history and detail of reclaimed materials, several of the artists featured in our spring 2018 catalog take the words reduce, reuse, and recycle to heart in the execution of their craft. And they’re not alone! 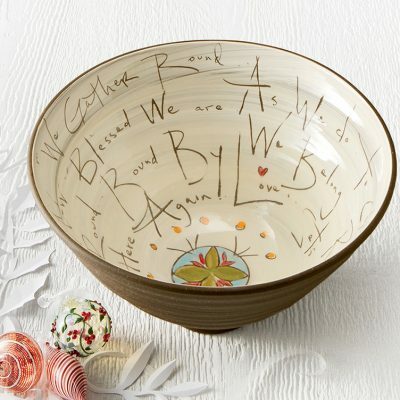 Many of the artists we represent embrace sustainable practices. Find out more about what compels some of these artists to turn to sustainable methods, and discover a sampling of their remarkable pieces. 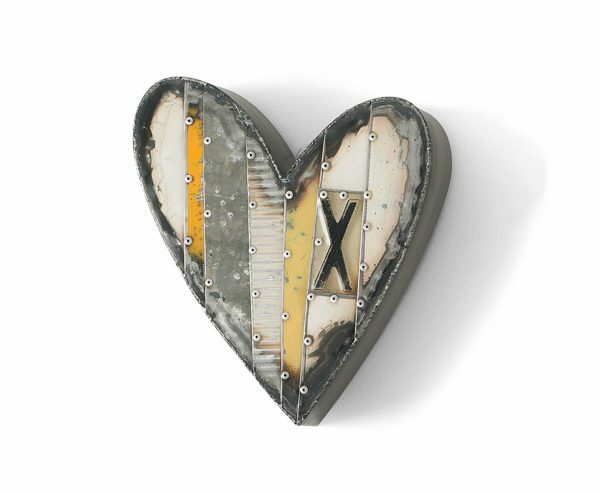 Anthony Hansen’s Small Yellow Heart with X. According to Hansen, these signs of wear represent a bridge between the past and present, from the reclaimed material’s former utility to your home as a breathtaking work of art. And because each piece of metal will have entirely unique markings, no two of the artist’s wall sculptures will be exactly alike. From old windows and shelves to shower doors and partitions, objects found near Mira Woodworth’s northern California home compose her spectacular crystalline sculptures and vessels crafted from reclaimed glass that is transformed in the heat of a kiln. Woodworth Each work is a treasure of vibrant color and rich texture—and they’re all, perhaps unexpectedly, crafted from reclaimed glass. This element of surprise is one of Woodworth’s chief reasons for utilizing reclaimed materials, transforming a previously “unwanted” item into a piece worthy of a gallery showroom. “To me, this speaks to a basic truth of the inherent (and sometimes secret) beauty in everything,” Woodworth says. 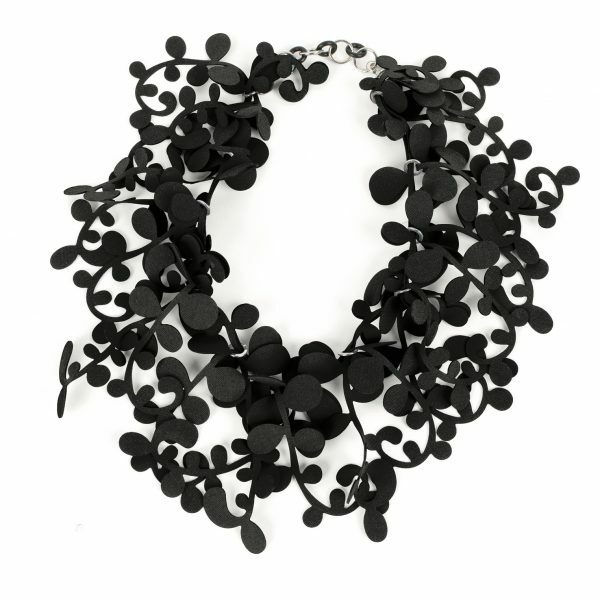 As a self-proclaimed eco-designer and artist, Kathleen Nowak Tucci creates adornments out of recycled rubber made primarily from bicycle and motorcycle inner tubes. Her motivation for utilizing these materials is twofold: first, to keep these discarded elements from collecting in landfills, but there’s also the added benefit of the materials’ exceptionally light weight, which allows her to craft ornate pieces that are surprisingly wearable. 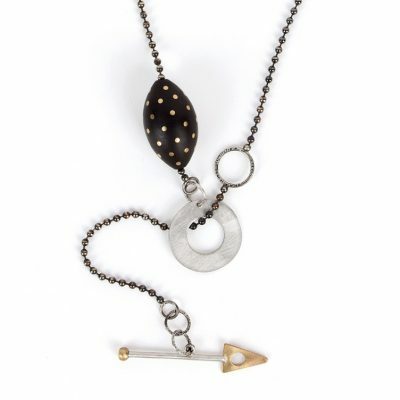 Kathleen Nowak Tucci’s Marie Necklace. Take the Marie Necklace: While the lush arrangement of vining tendrils makes a dramatic, elegant statement, it’s a dream to wear with its feather-light feel. New to Artful Home this season, Ciao Mao defines its creative philosophy with five basic tenets: original design, Brazilian soul, curatorship, quality and comfort, and a sustainable network. For the São Paulo–based footwear company’s founder, Priscila Callegari, the latter of these principles involves incorporating recycled materials into the unique designs. Ciao Mao’s Origami Shoe, styled three different ways. A new style for spring 2018, the Origami Shoe epitomizes Ciao Mao’s design perspective: the outsole and upper are crafted from recycled materials—rubber and jacquard, respectively—but the shoe also boasts convertible styling with removable accessories that make it remarkably versatile. 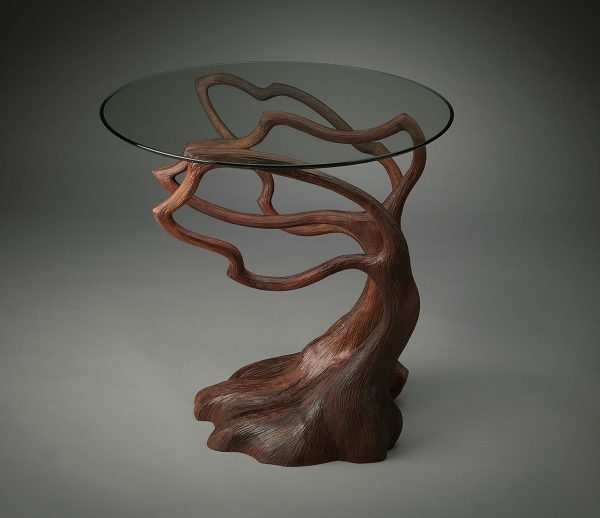 Aaron Laux’s Silhouette End Table. 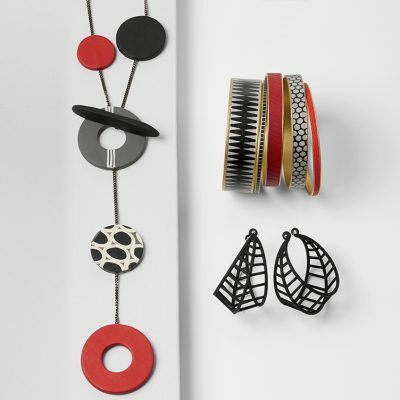 Jewelry artist Karin Jacobson’s handcrafted pieces are marvels of ornamentation—geometric necklaces, earrings, and bracelets made from ethically sourced materials, including recycled metals and gemstones that are fair trade, recycled, lab grown, or sourced from small, artisanal mines. 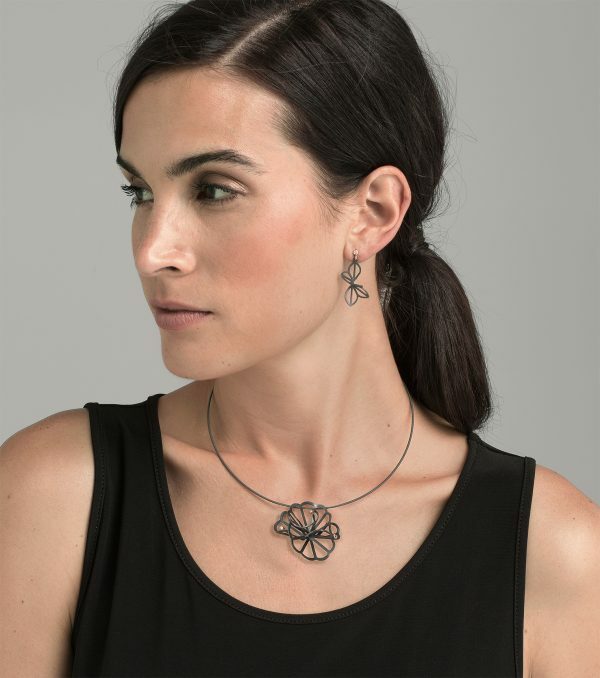 Karin Jacobson’s Petite Hyacinth Fold Earrings and Double Cloud Necklace. Jacobson fabricates recycled sterling silver into an origami-like arrangement in her Petite Hyacinth Fold Earrings, adding splashes of sparkle to their oxidized forms with scintillating recycled diamonds—proof that upcycled can also mean elegant. Visit artfulhome.com to explore our full art, decor, apparel, and jewelry collections, which include talented artists who invite sustainability into their studios.